I joined a book club so that I would read more books. That, I can hear you say is plainly obvious. Except, what happens, in reality, is that I start the month with good intentions of reading the book; go to bed slightly earlier, feel resolutely smug reading a few pages before I go to sleep. Then, life happens and I end up going out for drinks or a film screening and come home (ahem) not in a fit state to remove makeup let alone open a book. Also, the last few books chosen by the book club have been absolute monsters. So, if you promise not to grass me up – what I now try and do is at least read a quarter of the way in and then cram the ending. I know, I know – why even go? My book club is brilliant – savage, sharp and honest. It truly is a highlight in my monthly calendar. 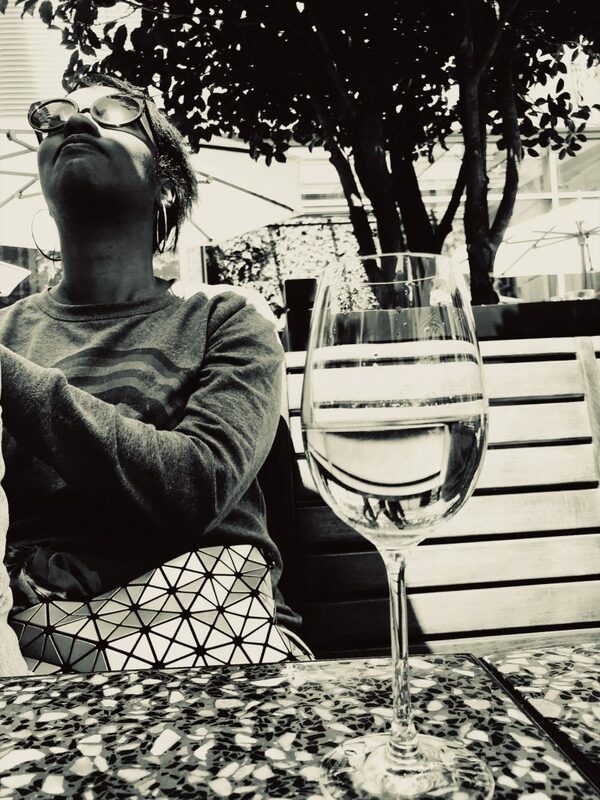 Every month I say I must try harder and well…anyway, at least it always means I eat somewhere quickly before 7pm on the second Tuesday of the month. This place is located in Covent Garden, just far away from the annoying bustle of the piazza but busy enough to provide ideal people watching opportunities. 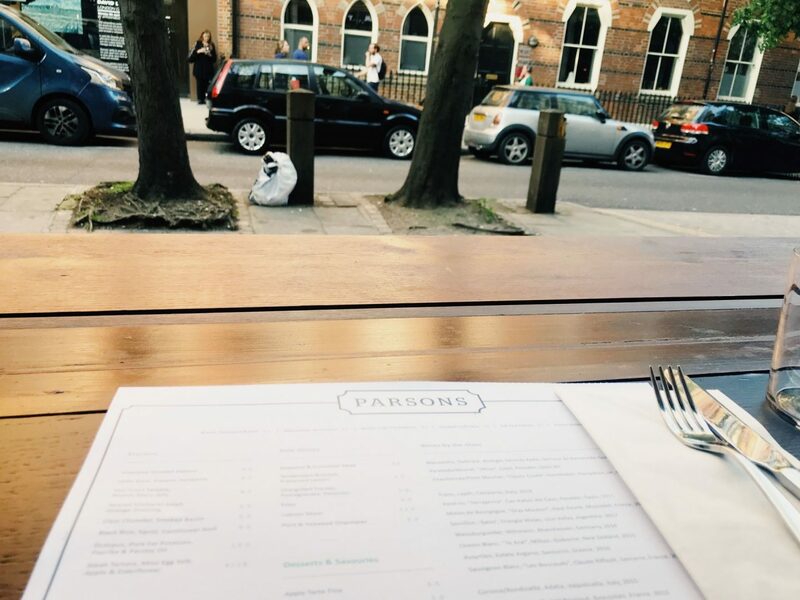 Now, Parsons is not a very big restaurant at all, however, it is thoughtfully laid out. There were spare seats looking out, with the windows open so that you could sit and say hello to anyone walking by. I asked for one of these seats thinking I would be told no. However, I was cheerful told, please take a seat and of course, I plonked my bum and the tome of a book down in front of me. The menu is a delight, there were so many things I wanted but I was running out of time not least because I needed to read that final chapter of the book. Also, it was hot and I wasn’t in the mood for something heavy. 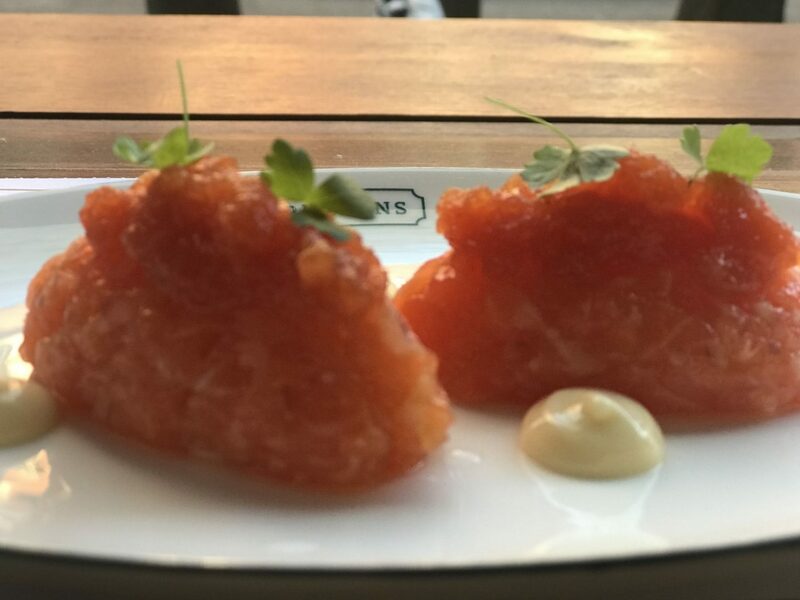 I hesitated between the bloody mary trout tartare or the oysters, the latter – I know I know – out of season but I love them so. Anyway, on the recommendation of the waitress, I ordered the tartare. I was not disappointed one iota. Spicy without being too hot and the taste and textures were a sensory delight. I could have eaten another plate it was so delicious. 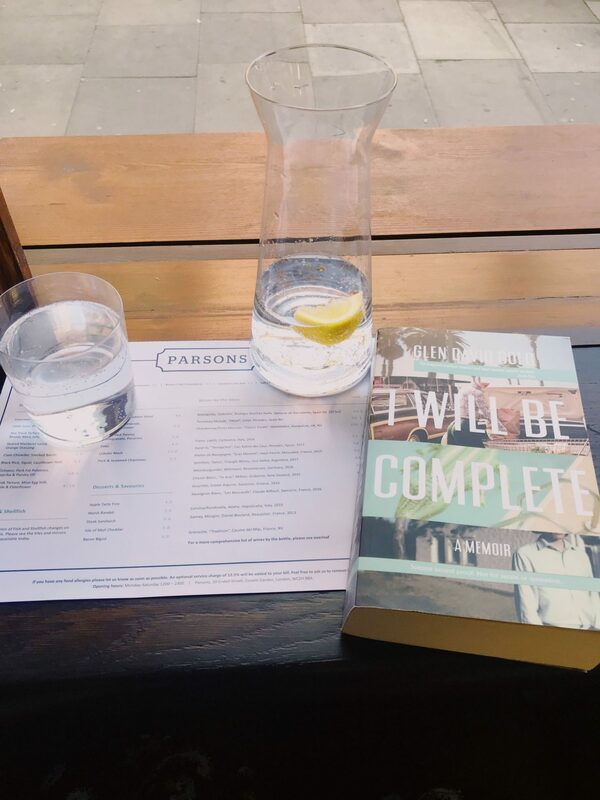 Next time I will go back and add a glass of wine, but last Tuesday night I had to be good – it was book club! Baby In The Corner? Baby got to choose where she wanted to sit! Pricey? Not really – although I didn’t have any wine it was under £10 for the deliciously light bites.